Another day, another tropical island. This one was a bit of a sticky proposition, as we had to go through face to passport checks in the morning, whether or not we were planning to get off the ship. There was a surprise repeat performance required at the end of the day, which made many people unhappy, not the least of whom was the captain. We had an American Express tour scheduled, which was to show us all of the important sights on the island. The first thing that caught our attention was all the fishing boats lined up in several locations in the harbor. They were all from Asia, and even though they looked abandoned, they had full crews on board. The next thing that stood out was the wonderful forms of the mountains. This is obviously an older island than Réunion, as it has many rounder, worn down hills. The first stop on our tour was the Pamplemousses Botanical Garden, really mostly an arboretum. The garden has some amazing trees, like the Baobob tree that Harry is standing next to. Our guide was very knowledgeable about the trees, including many Latin names. This palm tree is also very large scale. The sausage tree (pictured here) is one of the more unusual trees we saw. Pamplamousses means grapefruit, and to the people here it is an exotic tree. The temperature was fairly high and the humidity was about the same, so we were pretty well soaked by the time we left the garden. Our next stop was the sugar museum, an old sugar mill which has been turned into a museum where one can learn all about sugar production. Sugar cane is the main agricultural product for Mauritius. They also grow other fruits and vegetables, including edible palms - the ones from which hearts of palm come - for local consumption. The museum was interesting, but there was very little ventilation, so we once again were grateful to return to our nicely air-conditioned buses. We then drove up to Fort Adelaide, which dates back to 1835. Not much to see there, but the view from the top of the wall was quite nice. Older buildings on the island all have shutters to help defend against the typhoons. It is not clear how the modern high-rise buildings would survive such storms. There are not many of them. At last we drove out to Eureka House, a beautiful old mansion built entirely of wood, which was built prior to 1856. We were served a wonderful Creole lunch on the verandah. Here the weather did not have an adverse effect on us. After lunch we had a tour of the house, which is like many old homes. One thing they had in the house was a “double coconut”, or Coco de Mer, from the Seychelles, which is one of the attractions of the Seychelles. Our last stop of the day was at a traditional market, where part was dedicated to groceries, and part was dedicated to everything else imaginable - trinkets, tee shirts, fabric, baskets, spices. Our guide let us know that the merchants expect us to bargain, and that they are genuinely friendly, not aggressive. We would agree with that, based on our experience. 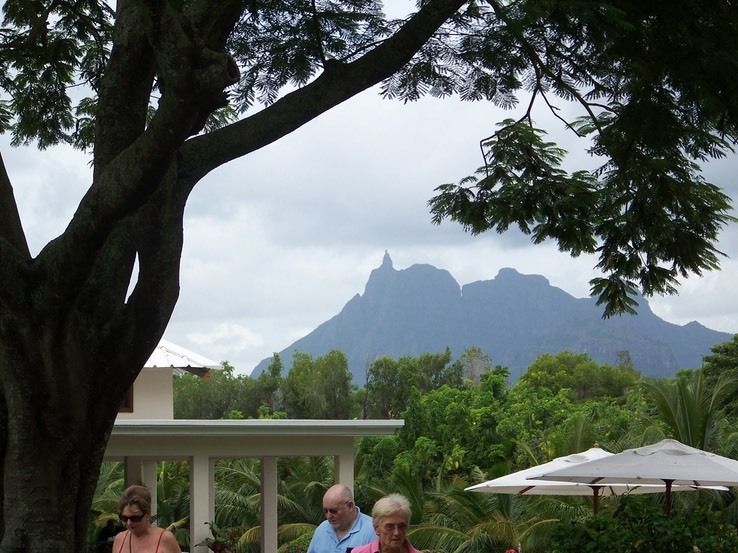 Mauritius has been settled by the Dutch, French, and British, in that order. The common language is French, although they start learning English in school at a young age. The British influence can be seen in the left-hand driving. Mauritius is truly multi-cultural. Many Indian people came to the island as indentured servants and stayed because the conditions were so much better than at home. Slavery had also been present on the island. The population includes people of French, Indian, and African heritage. While there we heard the Muslim call to prayer and saw a couple of Tamil (Hindu) temples. 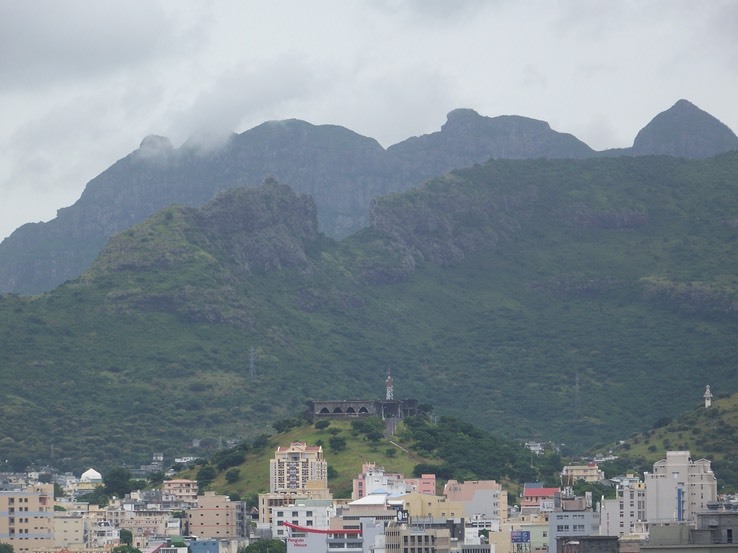 There are sections of Port Louis that are enclaves of different cultures, but they all seem to blend together well. Mauritius was also home to the now-extinct dodo bird, which was endemic to the island. They still capitalize on the dodo image, even though the bird has long been gone from the island. We enjoyed our time on Mauritius. Our guide, Jaya, was excellent. She was very knowledgeable and her English was wonderful. She was also very personable. However, many of the people we’ve talked to would be perfectly happy not to return to Mauritius, at least in part because of the immigration procedures we had to go through. Even though the immigration procedure was an imposition, it went very quickly for us both times. We would not need to come back other than to see the interior of the island, as we’ve seen most of the recommended major attractions there.